Women have been involved in leadership activities throughout the history of the United States. Not always called leadership, their capacities to deal with difficult situations, and to manage enterprises have been earned them the reputation of being strong and resilient, capable of great initiative. 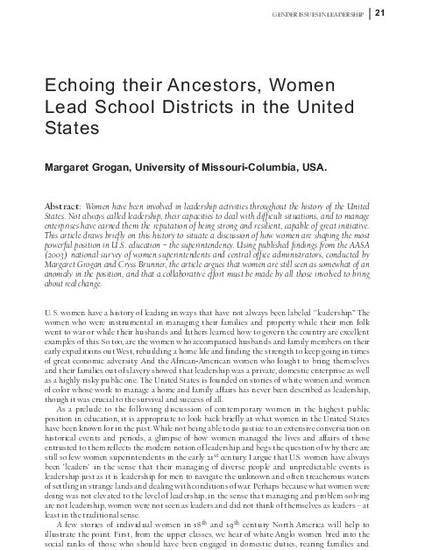 This article draws briefly on this history to situate a discussion of how women are shaping the most powerful position in U.S. education - the superintendency. Using published findings from the AASA (2003) national survey of women superintendents and central office administrators, conducted by Margaret Grogan and Cryss Brunner, the article argues that women are still seen as somewhat of an anomaly in the position, and that a collaborative effort must be made by all those involved to bring about real change. Previously linked to as: http://ccdl.libraries.claremont.edu/u?/irw,315. Grogan, M. (2005). Echoing their ancestors, women lead school districts in the United States. International Studies in Educational Administration, 33(2), 21-30.